Obermeyer blends Rocky Mountain attitude with Dolomite flair in its Tuscany Insulated Ski Jacket. This jacket combines 10K waterproof-breathable protection and Thermore® synthetic insulation. It's slimming cut, baffled fabric and faux fur trim team for a great look. Features like the articulated sleeves, a powder skirt, and a detachable goggle cloth will help you master the slopes. When you need to look great in the village and feel comfortable on the snow, the Tuscany Jacket makes it happen. "Can you wash the coat in machine"
"Most of our Obermeyer garments can be machine washed. However, to be certain, look for the care/cleaning instructions located on the black “care” tab attached to each garment prior to washing. We hope this information helps!" "Is the hood compatible with a helmet?" "Thank you for your recent inquiry. This jacket's hood is not designed to go with a helmet. Whether or not there is a way or not would be something outside manufacturer advisory and not something we could recommend. We hope this information helps. " "how does it fit? I am a tall 6'2" woman and trying to figure out what size to buy? they only show sizing up to xl. looking to see if i should buy 18, 20 or 22"
"Thank you for your recent inquiry. For measurements of this product, please see the manufacturers Sizing Chart . We hope this infomation helps. " "Hi im interested in the petite size. How long is the petite jacket? Thx Lea"
"The petite version of the Tuscany has an average center back length of 25½ inches. You can see all of our petite measurements by clicking on our size chart. " "I have the Tuscany hit from about 6 yrs should the Alpine rose be the same color as it was then?" "Obermeyer changes their colorways season to season. While it may have the same name it is not a guarantee that it is an exact match. Hope this information helps. " "How cold a temp is a 9/10 rating? Going to Alaska will Obermeyer Tuscany work at -20?" "A 9/10 warmth rating is great for temperatures 15°F and below. It has one of our highest warmth ratings. At such cold temperatures choosing the right base and mid layers is essential. Hope this information helps!" "Are there any inside pockets. And how many outside pockets"
"The Obermeyer Tuscany Ski Jacket has 5 pockets. On the exterior it 2 zippered waist pockets and a zippered wrist ski pass pocket. The interior has a goggle pocket (with a detachable scratch-free goggle cloth) and a large zippered media pocket. Hope this information helps!" "Does this jacket have vent under the arms for cooling?" "No, unfortunately, this jacket does not have the underarm venting feature. Hope this information helps. " "Does this jacket have a double zipper (can zip up from the bottom as well as down from the top)? " "The Tuscany Insulated Ski Jacket does not have a 2-way zipper. 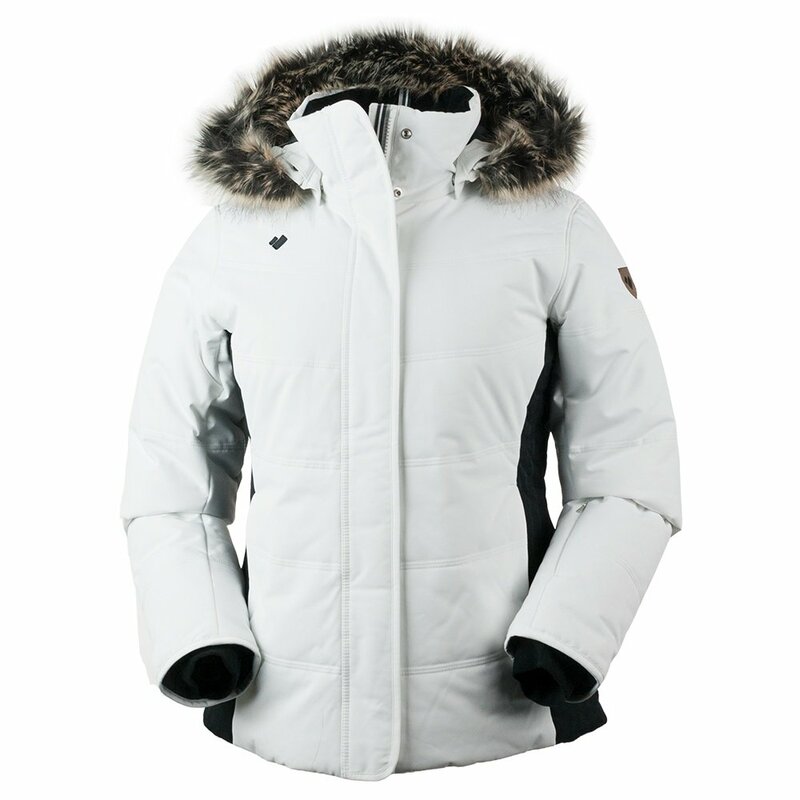 However, another option will be The Obermeyer Siren Faux Fur Insulated Ski Jacket. We hope this information helps!" "Any size 6 or smaller for this jacket available?" "Thank you for your inquiry. The smallest size we have in this jacket is size 8. We hope this information helps!" This is super cute jacket. I like how the back is rounded and it covers my bottom. Size medium is just right for my size 130lbs and 5'1.